From the first page, it’s clear that Dion has extensively researched the plot, delving deep into Cuban history and culture. Fidel Castro once said, “Men do not shape destiny. Destiny produces the man for the hour.” It’s a powerful idea that ordinary men can sometimes step out of everyday life to do something for the greater good. 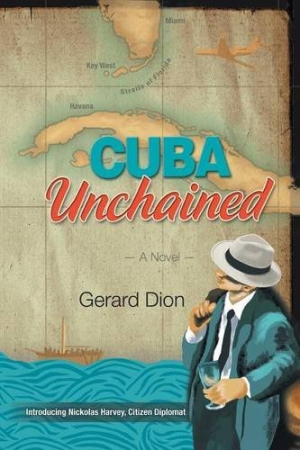 This idea is the centerpiece of Gerard Dion’s latest novel, Cuba Unchained. After years of building a successful defense contractor business, Nickolas Harvey is in semiretirement. A wealthy man with loving family and friends, he aches to make a bigger, more positive impact on the world. With the help of his colleagues, he launches Americans for Reconciliation with Cuba, an organization to reopen interests between the United States and Cuba. As Nickolas campaigns, his cause gains traction and attention, but not everyone agrees with him. Soon, Nickolas finds that leading a social cause can be a dangerous thing. From the first page, it’s clear that Dion has extensively researched the plot, delving deep into Cuban history and culture. Throughout Cuba Unchained, Dion crafts speeches where Nickolas talks in detail about Cuban political topics, such as the effects of the Cuban-American voting bloc in recent elections or how Castro came to power. He also builds a realistic side story where Cuban citizens Rose and Manuel Rodriquez discuss their plans to leave their homeland and make it to America. The combination of details and sharp dialogue give this political thriller a realistic and cinematic feel. When Nickolas makes an impassioned speech, it sounds like it might be a clip from C-SPAN or another news network. That realism spreads into warm and engaging conversations between Nickolas and his wife or friends. But sometimes that cinematic feel is too strong. As good as the dialogue is, the book relies too heavily on it, making is seem more like the work started as a screenplay before switching to a novel. This shows in some sections of dialogue where action or crowd reactions are written in parentheses and italics. The book also switches between present tense (which screenwriters use when writing action) and past tense within the same paragraph. In the end, it’s these small things that trip up Cuba Unchained. The book has the potential to be a political thriller in the vein of The Hunt for Red October. Still, this novel may appeal to anyone who enjoys history or fiction centered on American politics. Maybe with a little more editing, destiny may yet turn Nickolas Harvey into the man of the hour.